WILLEMSTAD - During the CARIFTA Games last weekend in the Curaçao Sports Center (SDK), the Curaçao athletes won a total of four medals. Gold was for pole vaulter Glenn Kunst. 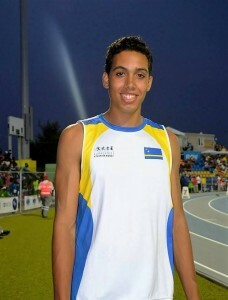 He jumped up to 4m 65, which is a record for the CARIFTA games. Silver was the high jumper Jaden Bernabela. For the women, there was bronze for Qyone Antersijn in the 1500 meters and Shuriantly Mathilda in the 800 meters. Curaçao finished seventh in the medal count. Jamaica was first with 86 medals in total including 39 gold. Curaçao will be hosting the CARIFTA Games in 2020 again. According to the organizers, it was a great success. Glenn Kunst also received the Sir Austin Sealy Award for the most outstanding athlete during the games.